London, 30th September 2013 - Family baker Warburtons has today released results of a tasty study it commissioned into modern UK lunching habits. The research has helped the company to understand the phenomenal growth it has seen in its sales of alternatives to the classic sandwich, such as Thins, Pittas and Wraps, which have increased by 92% in the last year. The study also reveals a new breed of luncher – the so-called ‘Luncheonist’ – an amateur food stylist, who has both a growing obsession and a competitive nature, fuelling a passion for how their lunch is presented to those around them. 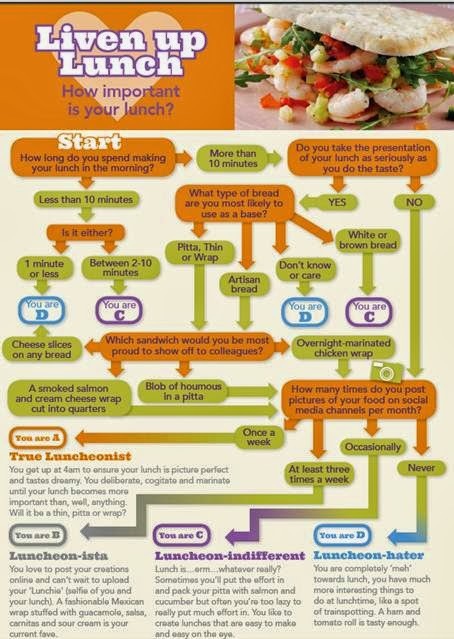 It’s not just social media where the nation feels the need to compete over food, as over a third of people (36%) think their work colleagues judge them for the lunch they bring to work and even in the home, 30% of mums believe making their child’s lunch box is the most important out of their morning tasks. Not only this, when hosting lunches for their friends, 80% of mums spend up to an hour preparing lunch, with 52% of mums hosting more lunches in one month than evening events. It appears that ‘Luncheonism’ is emerging as a new trend partly due to the impact of TV shows like The Great British Bake Off and Masterchef showing people how to use new products, mix flavours and, importantly to ‘Luncheonists’, present food in an appealing and appetising way. This new mentality is seeping into the nation’s psyche making ‘lunch envy’ ripe amongst UK offices. It isn’t just the office workers who are ‘Luncheonists’ – mums are getting in on the act too as ‘Luncheonism’ extends around the UK. Mums nationwide agree that making their ‘Mini Luncheonist’/child’s lunch box is the most important out of their morning tasks, ensuring their child does not suffer lunchbox envy. Keeping up with the Joneses is still a phenomenon alive and well in 2013 with women looking to impress their friends by ensuring their food looks as good as it tastes, clearly taking a leaf out of Paul Hollywood’s book. It seems lunch parties are the new dinner parties. For lots of inspiring ideas and recipes to help bring out the ‘Luncheonist’ in you, please visit the Warburtons Facebook page – www.facebook.com/warburtons. I received no payment or products for sharing this information.